Your highness, be on your guard. 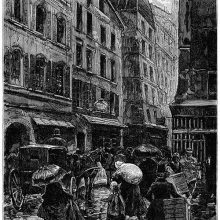 Two men are standing in the rain in a narrow street at night, under the lantern of a seedy hotel. The caption reads in the original French: Monseigneur, prenez bien garde !